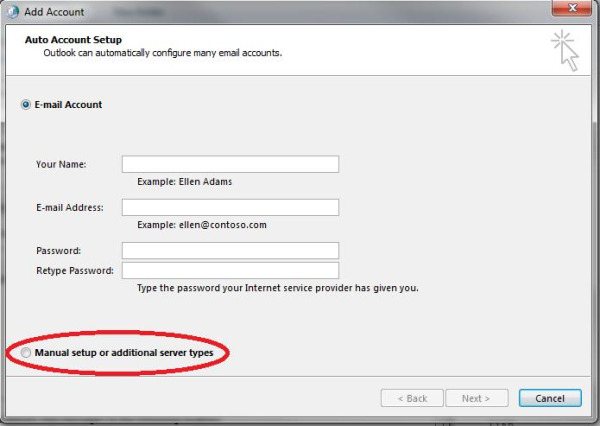 The following 9 steps should provide you the basis to create a POP3 or IMAP4 account in Outlook 2010 or 2013. Many other lists would post 10 steps, but we value creativity, brevity, and realize that your time is too valuable to waste with an additional step. Also through Outlook 2010 or 2013, you should be able to connect using Microsoft Exchange rather than POP3 or IMAP4. Microsoft Exchange provides additional calendar and information sharing features that are not available through POP or IMAP. For more information please visit, What Separates Exchange from Simple Email Access?, which is posted at the bottom of the article. 1. Open Outlook. If the Microsoft Outlook Startup Wizard appears, click Next. On the following E-mail Accounts page, click Next to set up an email account. If the Microsoft Outlook Startup Wizard does not appear, go to the Outlook toolbar and click the File tab. Afterward, click on Add Account (which is located just above Account Settings).